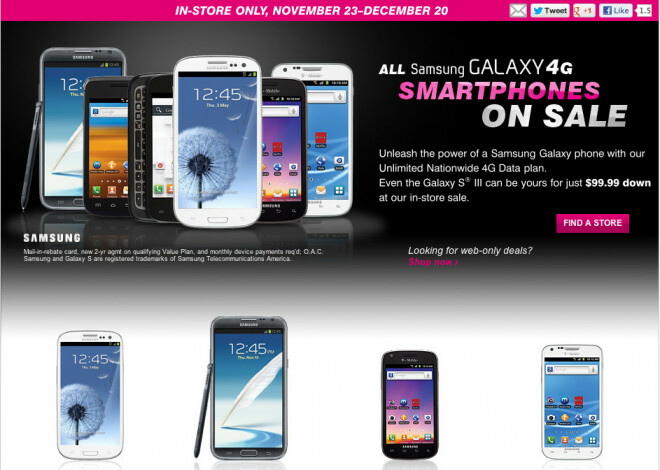 T-Mobile is "extending" its sale on Samsung Galaxy devices and the sale will now run from Black Friday through December 20th. The new sale covers a qualified Value plan for which you will need to sign a 2-year contract. That means you will have to make a down payment and 20 monthly payments toward your new phone. For the Samsung Galaxy S III, since we figured you would ask, you will need to put down $99.99 (after a $50 mail-in-rebate) and pay 20 monthly payments of $20. The Samsung GALAXY Note II is $199.99 down after a $100 mail-in-rebate and then 20 monthly payments of $20. The rest of the phones on sale include the Samsung Galaxy S II, Samsung Galaxy S Blaze 4G, Samsung Galaxy S Relay 4G, Samsung Galaxy Exhibit 4G and the Samsung Galaxy Tab 2 10.1. The Samsung Galaxy S II and two other models can be picked up with no money down after the mail-in-rebate. The deals are available in store only, so make it a point of visiting your local T-Mobile store if you're looking for a Samsung Galaxy handset. wtf 299 for a note up front 100 dollars back then you spend 20 dollars a month no it? what kind of deal is that ? a hold up? who does mail in rebates anymore...god! I remember working at sprint they said they only did mail in rebates because more then 2/3rd s of customers never sent them in and they only want to instant rebate when they got in trouble for "loosing" so many customers rebates lol now any mail in rebates are done by a 3rd party. I am a 3rd party for sprint, att, and verizon and we do not do mail in rebates. we give instant rebates. Seriously, that is some bs deal! After they add in all the taxes and crap you're basically renewing your contract and buying the phone full price! But but but the SAVINGS! Think of the LOL savings lol! So t-mobile wants me to sign up for 2 more yrs pay $99 up front then $400 in 20months =$450 since they will return $50 by mail in a form of a credit card just to get a gs3. They call that a "great deal" hell no!! I'll just buy it at retail price & forget having me attached to them for another 2 years. you forgot the upgrade fee of $18 and taxes on top of the $99. Total to the pennies... $476.24... Retail price $529. 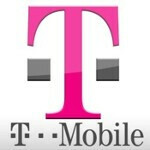 You save $52 with T-Mobile but stuck on a contract. Crappy deal T-Mobile! ...There's no upgrade fee on the Vale plan...because you do installment payments. ...So yea...that information is NOT correct. The samsung sale made all phones FREE after mail-in rebate, except the Galaxy Note. With a single line Value Unlimited Talk & Text plan along with unlimited 4g data you pay about $98 after taxes and tha price includes the $20 installment for the phone over 20 months...then the $20 drops off and you're at $88...Value Plans are cheaper than Classic plans where they get discounts on phones...you guys need to first understand how things work before giving biased opinions...you guys sound worse than iPhone junkies. Hell, I'd bet you all are paying over $110 for an unlimited plan on Verizon or At&t and they don't even offer unlimited data...OH, BUT WAIT! YOU GOT YOUR PHONE FOR LITTLE TO NOTHING, DID YOU?! OH, AND YOU'RE PAYING MORE THAN $98 A MONTH...?! still think you're getting a deal elsewhere?! why the mail in rebates! f**k, give us the sale right there right now! Dammit I'm moody this morning! It's the company's choice. Get over it.